Andy Beshear and Matt Bevin. Kentucky.com. Governor Matt Bevin and Attorney General Andy Beshear are going at it again and this time, Bevin has brought Northern Kentucky into the fight. In a move that he called, "unusual," the governor has accused the attorney general of seeking to silence Judge-Executives in a Supreme Court university allotment case that would cut the state's public institutions' budget 2 percent. County Judge-Executives from Campbell, Boone, Kenton, Bell, Crittenden, Trigg, Garrard, Simpson, Warren and Jessamine counties have asked to file an amicus brief in the Supreme Court in support of Gov. Bevin. The Attorney General has asked the court not to consider the Judge-Executives’ brief. In May of this year, Beshear had previously asked the Kentucky Supreme Court to consider his case against the budget cuts. “If left to stand, it will eviscerate the strong separation of powers doctrine of the Kentucky Constitution and create untold constitutional conflicts in future appropriation cases,” Beshear wrote. Franklin Circuit Judge Thomas Wingate issued his opinion May 18, several weeks after Beshear and three Democratic House members from Louisville — Mary Lou Marzian, Darryl Owens and Jim Wayne — sued Bevin for ordering 2 percent midyear cuts to the state’s public universities. Beshear argued that the governor could not make cuts in an already-enacted state budget unless there is a shortfall in state revenue. Bevin has said the cuts are necessary to provide more funding to the state’s beleaguered public employee pension system. 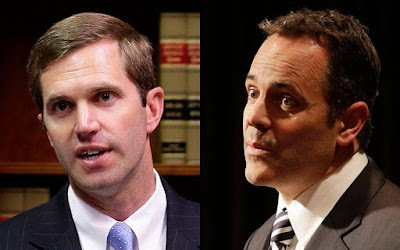 Judge Wingate ruled against Beshear, holding that his position was “both an irresponsible one and an unsustainable one for a government to take.” The Attorney General then appealed to the state Supreme Court. On Thursday, the Court will hear arguments in the case, but if the Attorney General is successful, the brief of local officials will not have a chance to be considered, according to Communications Director for Bevin, Jessica Ditto. “Attorney General Andy Beshear is playing politics again and is trying to silence the voices of County Judge-Executives,” said Ditto. “He lost his lawsuit and is afraid to let the Supreme Court hear how his irresponsible position will negatively affect counties by not allowing county judge-executives the flexibility they need to manage their own finances.